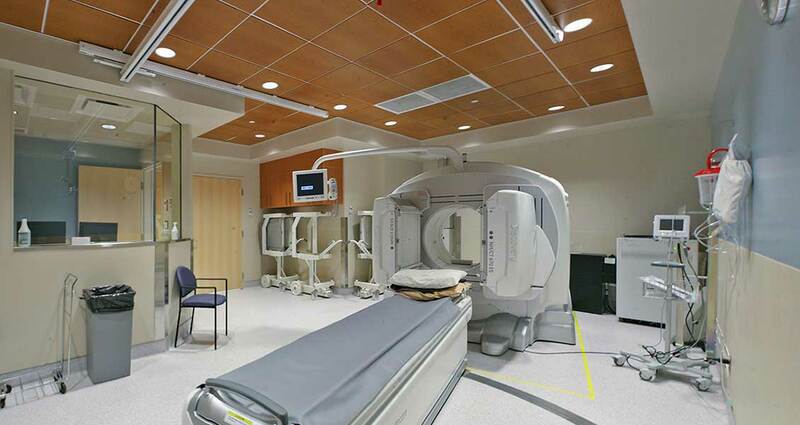 KGH Gamma Camera Renovation, with a construction budget of $370,000, included three existing rooms within the Diagnostic Imaging Department at Kelowna General Hospital. Of the three rooms, one room was repurposed as a Storage Room and the other two were combined to create a Gamma Camera and Control Room. The Storage Room underwent a modest renovation whereby an existing sink, counter, mop sink and its concrete pedestal and flooring were removed. The room was painted and had new flooring, base boards, wall protection and electrical light switches and receptacles installed. The two rooms which now serve as the Gamma Camera and Control Rooms, underwent work including demolition of dividing walls, existing ceilings, removal and relocation of Medical Gas, construction of new walls, bulkheads, metal ceiling tile system and lighting, construction of new Control Room with leaded glazing, construction of leaded shielding at all perimeter walls, coring for new GE Gamma Camera machine, installation of new air mixing box and ducting which was designed to supply air closer to the floor level as per requirements by the machine manufacturer. The renovation included installation of new millwork, new flooring and flash cover, new hand hygiene sink, various electrical and computational equipment, existing Angel lift.